Ireland is home to some of the most beautiful churches, cathedrals and oratories. We’ve compiled a list of our top 8 favourite churches found throughout Ireland, most of them in remote locations surrounded by beautiful lakes, cliffs and mountains showing the true beauty that Ireland has to offer. Dunlewy Church is set in the Poisoned Glen, one of the most beautiful spots in Donegal. Set in a small glacial valley sandwiched between the stunning Errigal slopes, Lake Dunlewy and the Glenveagh National Park with gorgeous views in every direction, no roads and green and lush bog land this truly is a sensational setting. Coolcarrigan Church in Nass, Co Kildare, was founded in 1881. It is built in a stunning woodland setting surrounded by a circular dry moat and can only be entered by passing through a lychgate. It’s remoteness and tranquility add to the beauty of the building itself. The Gallarus Oratory, standing amid farmland on the Dingle Peninsula in Co Kerry was the place of worship for early Christian farmers of the area. Shaped like an upside-down boat, the simple dry-stone structure has remained waterproof to the present day. Still standing in perfect condition, this truly is a beautiful structure surrounded by the rural and picturesque beauty of Dingle. Gougane Barra Church lies west of Macroom, Co Cork dating back to around 1700. During the times of the Penal Laws, Gougane Barra’s remoteness meant that it became a popular place for the celebration of the Catholic Mass. It is now famous for it’s picturesque location and beautiful interior. St Gobban’s Church is located in Portbraddan on the North Antrim Coastline. Portbraddan which consists of only a handful of houses is as quaint and quiet a place as you can get in Northern Ireland. 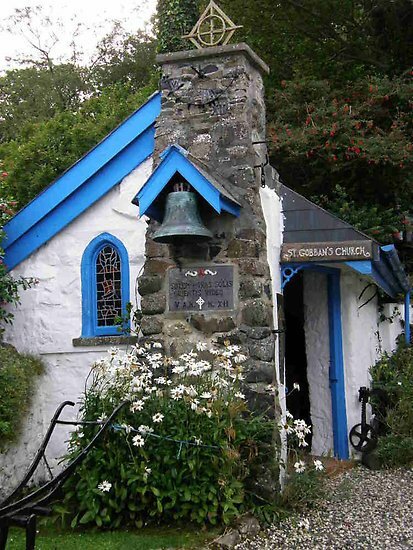 Only around 8 feet by 4 feet in size, this tiny Church is thought to be the smallest church in Ireland. Croagh Patrick, which overlooks Clew Bay in County Mayo, is considered the holiest mountain in Ireland. Croagh Patrick is renowned for its Patrician Pilgrimage in honour of Saint Patrick, Ireland’s patron saint. It was on the summit of the mountain that Saint Patrick fasted for forty days in 441 . From St. Patrick’s own time there had been some sort of a little chapel on the summit. 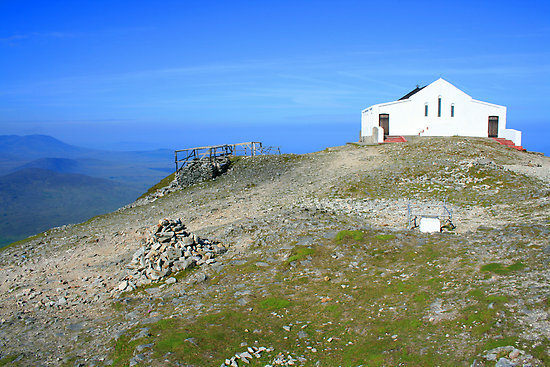 A new chapel was built on the summit on 20 July 1905. The chapel still sits on top of Croagh Patrick looking down on a mesmerizing view of Clew Bay. This quaint church located in Glendalough, Co Wicklow with a small round tower incorporated into the main structure is one of the few complete monuments in Glendalough. As the tower looked like a chimney the whole church was nicknamed “kitchen”. The round tower beside it is one of Ireland’s most iconic buildings standing 100 feet high. One of the most memorable views along the north coast of Ireland is that of Ballintoy Church. Ballintoy is a small village and civil parish in Co Antrim in Northern Ireland. Ballintoy Church was found by the Stewart family who settled on the north coast in 1560. The distinctive white church on the hill above the harbour and the majestic backdrop view are simply breathtaking. Take a look at our beautiful range of Irish Easter gifts for you to surprise your loved one with, from authentic rosary beads, to religious jewelry, Irish linen, Irish food baskets and more.